SkyCiv has included some keyboard shortcuts to make your data entry faster. Delete: Delete members or plates after they are selected. Esc: Cancel the current processing operation. 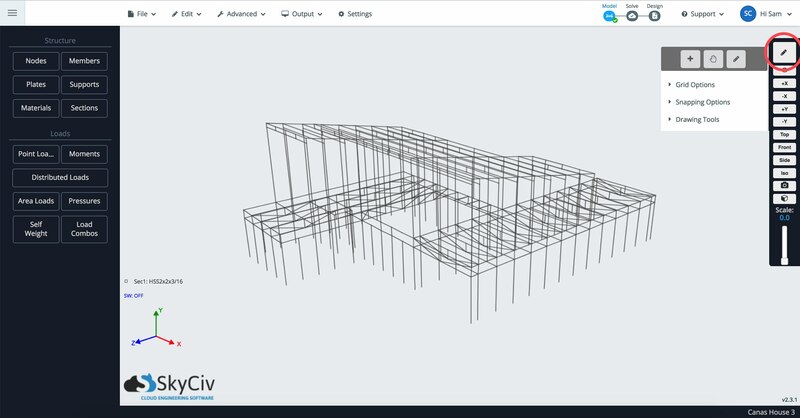 Rotating – Left click and drag to rotate your structure. Panning – Right click and drag to pan. Alternatively use Shift + Left Click. Select – Left click a member/node/plate/support/load. Multi Select – Ctrl + Left Click. Create Member – Left click starting node, drag to ending node, and release on ending node. SkyCiv has introduced a couple of quick repair functions that allow users to easily detect and repair issues with your model. This is slightly different to SkyCiv’s Repair Model functionality which will repair your entire model. This is focused on your highlighted elements that the user can easily identify. For instance, two nodes closely together can be merged using the Merge Nodes feature. Here is the full list of quick repairs that are automatically detected by the software when you highlight and right click parts of your structure.